By Chris Nichols on Monday, January 14th, 2019 at 1:48 p.m.
Democratic Gov. Gavin Newsom took his first step toward guaranteeing free community college in California last week, marking early progress on one of his top campaign promises. Newsom proposed spending $40 million during the next fiscal year to extend the California College Promise program to a second year of free community college for eligible students. Gov. Jerry Brown signed the program into law in 2017, creating one free year of tuition for students who meet certain criteria. 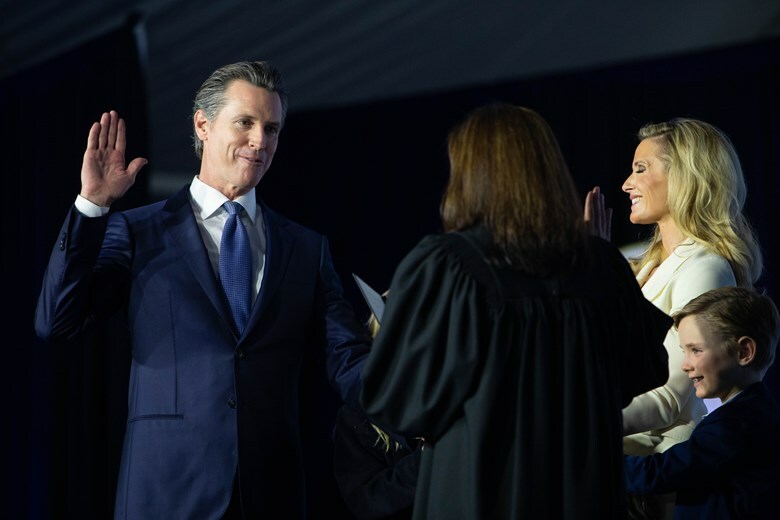 "We're going to get that second year of free community college," Newsom, who was sworn-in last week, told reporters during the unveiling of his 2019-2020 fiscal year budget in Sacramento. Newsom's move, which must be approved by the Legislature before it can go into effect, would only pay for a free second year for an estimated 28,000 students. That's about 1 percent of the state's 2.1 million community college students. Through a separate program, the state already covers tuition for about one million low-income community college students, according to the California Community College Chancellor's Office. H.D. Palmer, a spokesman for the state Department of Finance, said eligibility requirements will limit how many students can get free tuition. They must be "first-time, full-time" students and can't already receive fee waivers, Palmer said. Students who take 12 or more semester units are considered full-time. The vast majority of community college students are considered part-time, according to data from the California Community Colleges Chancellor's Office. Just 26 percent, or about 400,000 students, were full-time during the 2018 spring semester, the most recent for which data was available. Of those, there were only 100,000 first-time, full-time students for the full 2017-18 academic year, according to the governor's office. Nearly two-thirds, or 64,000 students, had already qualified for free tuition under a separate program. Another 9,000 didn't qualify because they were out-of-state students. That left about 28,000 students eligible for the second free year, a governor's spokesman explained. The College Promise program also requires students to complete and submit either a Free Application for Federal Student Aid or a California Dream Act application. In addition, the program is available only to in-state community college students. Progress on Newsom's promise could be made if the Legislature approves his budget budget later this spring. Another option is for state lawmakers to pass Assembly Bill 2, legislation proposed late last year by Asm. Miguel Santiago, D-Los Angeles, which also calls for a second year of free community college tuition and has the same eligibility requirements. Santiago authored the original bill that became the College Promise program in 2017. The average community college tuition in California is approximately $1,636 per year for in-state students and $6,797 for out-of-state students, according to the Community College Review website. Danny Thirakul, a student trustee at the Los Rios Community College District in Sacramento, said he's excited about Newsom's pledge. "I think it's a great first step into really making college tuition-free and lowering costs for all students statewide," Thirakul said. "I think it's really important to continue after this also, you know, to look at other costs, non-tuition costs, because those are also what are driving student debt up as well." "Extending the College Promise will give more Californians the opportunity to gain the skills and credentials needed to succeed in today's economy," added California Community Colleges Chancellor Eloy Ortiz Oakley, in a written statement. "We will work with the governor and Legislature to expand this opportunity to put students first." Newsom's action marks the first substantive, though not complete, progress on this promise. In coming months, we'll track how far it goes. PolitiFact California's Newsom-Meter is tracking 12 of Gavin Newsom's campaign promises on everything from housing to healthcare, education, homelessness and the environment. Ultimately, we'll rate each as a promise Kept, Broken or Compromise. More information about tuition assistance through the California College Promise program is here. UPDATE: After we published, a spokesman for Newsom provided additional information about how the governor's budget established its estimate that 28,000 students out of a total of 2.1 million full- and part-time, would be eligible for the second free year of college. We have updated the article with that explanation. PolitiFact California intern Sami Soto contributed research to this article.